Abstract: - The new LCMS-P 80 Tool is capable of pipetting whole blood with normal hematocrit levels (30-50%) directly from primary tubes with good accuracy and precision, applying one average correction factor. For high hematocrit levels a different correction factor should be applied. - Wash procedures were established to minimize carryover of analytes. A procedure to minimize the deposition of blood on system surfaces proofed successful. 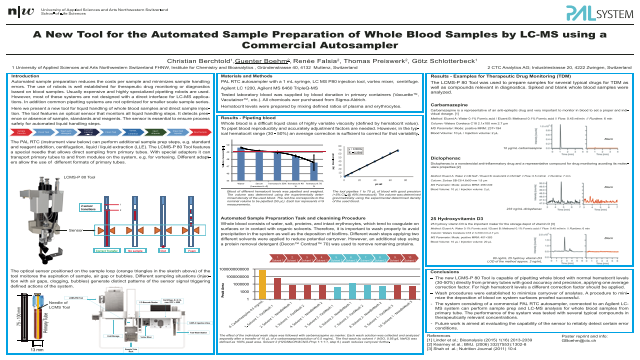 - The system consisting of a commercial PAL RTC autosampler, connected to an Agilent LC-MS system can perform the complete sample prep and LC-MS analysis for whole blood samples from primary tube. The performance of the system was tested with several typical compounds in therapeutically relevant concentrations. - Future work is aimed at evaluating the capability of the sensor to reliably detect certain error conditions.Summary: Automated sample preparation reduces the costs per sample and minimizes sample handling errors. Usually expensive and highly specialized pipetting robots are used. However, most of these systems are not designed with a direct interface for LC-MS applications. In addition common pipetting systems are not optimized for smaller scale sample series. Here we present a new tool for liquid handling of whole blood samples and direct sample injection.